MOST COMFY. The award winning Gunapod in extra-luxurious, super soft rayon from bamboo duvet. 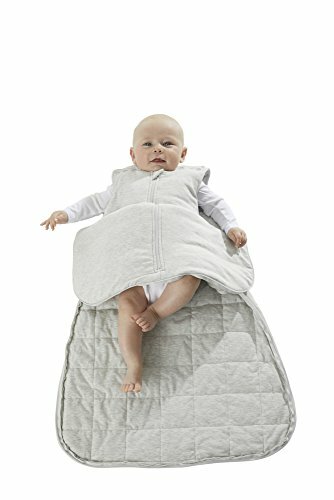 Designed to provide the ultimate sleep experience for baby with the most generous fit of any sleep sack - wider, longer, larger armholes, for a more comfortable fit! Extra room for hip-healthy kicking + folding legs, but cannot be kicked off so baby stays covered all night. SPECIAL FEATURES. Premium down-like hyperallergenic fill wrapped in silky soft viscose from Bamboo feels like a down comforter, making this the most cozy comfortable wearable blanket. Unique design with soft pressure pts mimics mom's hug for a better sleep. Inside box construction keeps fill from shifting providing all-over even temperature. You'll wish we had one in your size. SMARTER. WONDERZiP offers 3 options - allows sack to open just the bottom for easy diaper changes, or completely from either side for sleeping baby transfers, or the traditional middle. Your choice. SAFE SLEEP. Certified Pediatric Sleep Consultant Approved, Winner of International Hip Dysplasia Award, Mom's Choice Award, First Candle Safe Sleep Award, Dr. Toy's Best Picks Award, Family Choice Award. Exceeds highest USA, CPSIA + AAP, International safety standards. International Hip Dysplasia Award. Toxin-BPA-Phthalate Free. Rigorously tested to keep your baby safe. If you have any questions about this product by Gunapod, contact us by completing and submitting the form below. If you are looking for a specif part number, please include it with your message.